A tennis bag is as personal as a racket. And it should be chosen depending on what kind of accessories you use as a player. You may be tempted to choose a bag according to what it looks like (or maybe that’s just me) but you really need to make a decision based on all the stuff you take with you to the tennis court. Otherwise you’re going to need to buy a second bag. Tennis bags come in four basic styles. You’ll see tennis duffel bags, sling bags, backpacks and tennis totes. 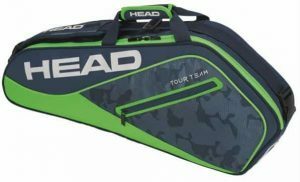 Each of these bags has their own pros and cons, but essentially you’ll need a bag that is the right size and shape to transport all your tennis gear. This seems obvious but most players don’t really assess how much stuff they carry in their tennis bag. If you can work out how big you need the bag, you can easily select the correct bag for your convenience. 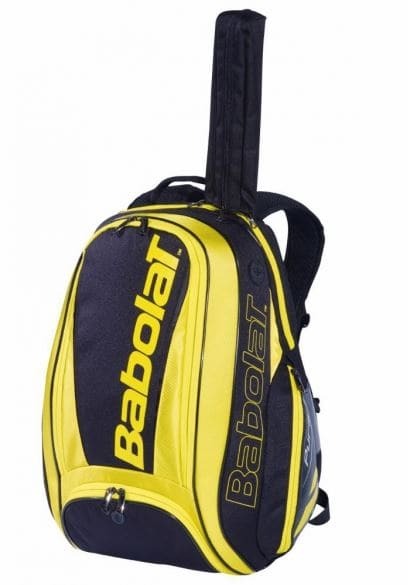 If you don’t take anything but your rackets, then you can go with a simple bag designed to only hold a racket or two. But most of us need a bag for more than rackets. 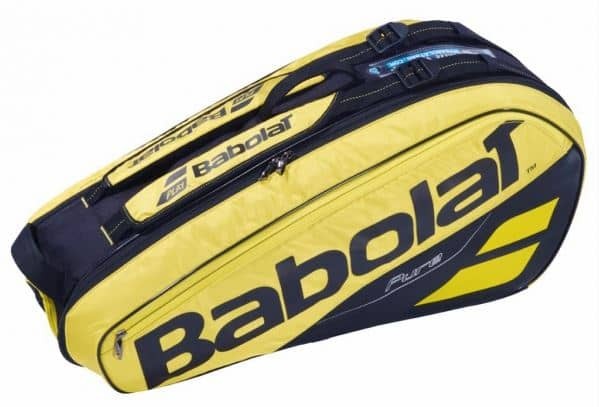 If you buy one of the tennis bags that holds 6 rackets and you actually want to carry 6 rackets in it, then consider buying a bag that says it holds 9 rackets so you’ve got enough space for other items. This is so important but most people underestimate how big they need their bag. 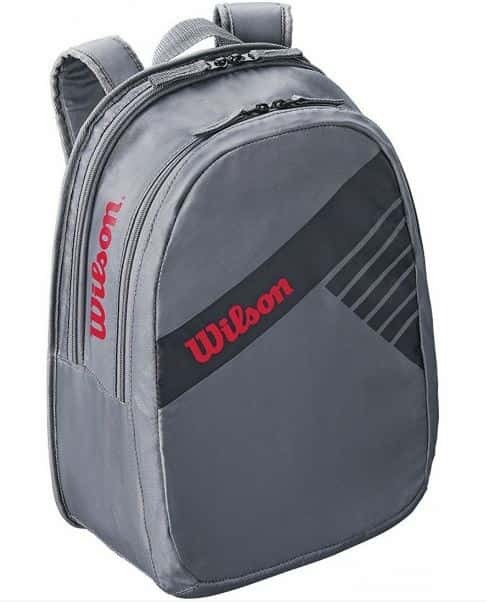 If you like to carry your tennis footwear with you rather than wearing it to the court, then you’ll want a larger bag that’s designed to be roomier. Some of these bags also include a ventilated compartment for your shoes. The kind of accessories the bags can hold are similar, what makes them different is the amount of accessories they can carry. Do You Keep the Racket Covers On? 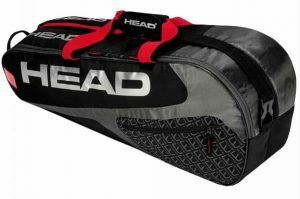 You’ll want a tennis bag that will hold your rackets and keep them from damage during transport. 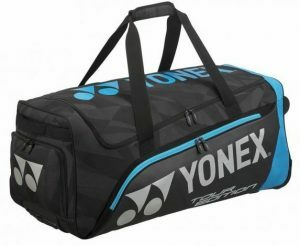 If you like to transport your racket back and forth with the added protection of a cover, then make sure that you get a bag that allows the extra space for the racket cover, because some bags don’t give you that option. You need to check the size. 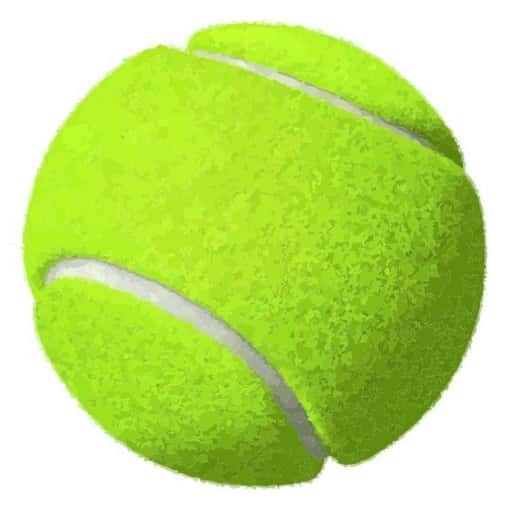 Remember to take into consideration the number of tennis balls you’ll want to bring along. If you want to take a couple of cans of balls with you, then allow for this. If you plan to bring a jacket to the court or a change of clothes, you’re going to want a bag that’s roomy enough to hold all of your clothing. And while most sling bags can hold an extra shirt, it’s tougher to pack in an entire change of clothing if you also have all your gear too. For bringing along a water bottle or two, you’ll need a bag that has an accessory pocket that can support a water bottle and keep it in an upright position to prevent leakage. Need a Pocket for Your Cell Phone? Most tennis bags will have plenty of separate accessory pockets for each item you bring, but some will only give you the bare minimum. So it’s wise to figure out what you bring to the court on a regular basis and then base your purchase on that habit. You can get bags that have padded pockets so that you can keep items like iPads tucked in there and some of them also have cell phone pockets to keep your phone handy while you’re playing. There are also bags that come with some accessories already included. You can find ones that include a few cans of quality tennis balls, string dampeners and even wristbands. If you look at the sling bag, you’ll notice that this style has a wide, padded handle and it goes easily over one shoulder. Backpack tennis bags may have resembled school book bags in the past but they’re a lot more stylish now. They’re a lot roomier and sturdier. These backpacks usually have two padded handles so that you can slip it over your shoulders. You’ll find many of these have small side pockets to keep your car keys handy. Tennis duffel bags are the largest of the bags and lots of them have a ventilation pocket for shoes. If you’re going to carry your tennis shoes to the court this becomes really important. Some of these larger size bags come as a trolley bag with wheels. This is great for traveling too. 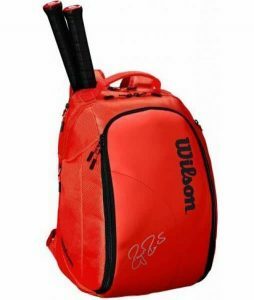 These days women can choose a tennis bag that is not only functional but also looks attractive. Many women are not concerned about this. But, personally, I love being able to choose the color of my tennis tote. Check out lots of women’s tennis bags here. Yes, tennis totes are now available so you can fit a couple of rackets with the handles sticking out the top. This is great if you know you’ll be stopping somewhere on the way to or from your tennis match. And a tennis tote makes a perfect gift for the stylish tennis player in your family. A tote lets you avoid a large backpack style of bag and keep everything more manageable (if that’s what you want). Yes, you can get multiple colors in the tennis totes. 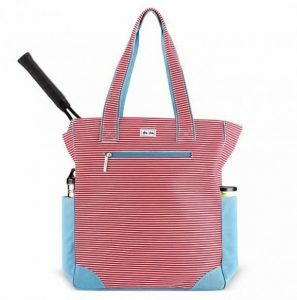 And I love the color of the tennis tote shown here. It has separate pockets for your drink bottle and for a can of tennis balls. Do your kids need new tennis bags? 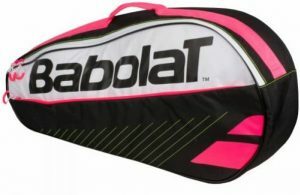 There’s a great selection available for children, see lots of great junior tennis bags here. Kids’ tennis bags come in lots of different styles. Most kids seem to prefer either a backpack or a racket bag that is big enough to fit a water bottle, towel and other items. 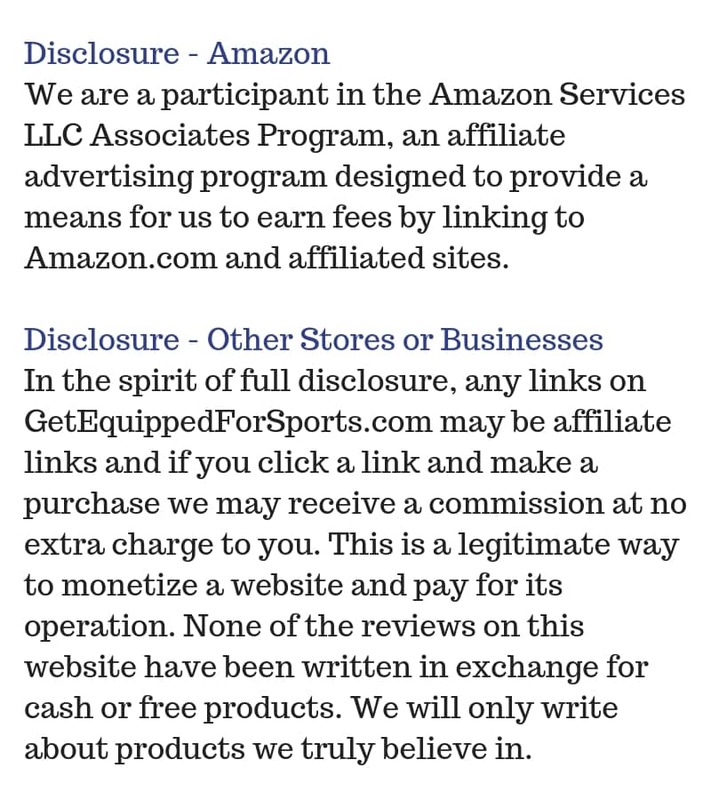 You can let them choose based on color, or size or brand. Ordering online makes it easy to stock up on gifts leading up to a birthday or Christmas.